Planning your wedding in Spain can be a fun time – but, like planning any large event, there are also plenty of things you need to research properly. Many of our bridal couples take the simpler route of marrying discreetly in a registry office in their respective country, then having their wedding ceremony and party in Spain. But if you’re looking to marry in a Catholic church in Spain, you don’t need to do it that way. Although it’s not possible to have a civil ceremony in Spain unless one or both of you are residents, it IS possible to marry legally in a Catholic church. The process is not as scary as it sounds, and we’ll be by your side throughout to guide and advise you on everything you require. Firstly, you need to ensure that one of you is Catholic. Don’t worry if both of you aren’t, the other one can get special dispensation from the Church – your local priest back home can explain the procedure to you. In this article we’ll be outlining all the documents you will need to make your church wedding in Spain dreams come true, and the process involved. Also, please remember, that you can’t submit the church paperwork until 6 months before the wedding. Your first step is to talk to the priest in your local parish (ideally the church that you attend back home). He will give you a pre-nuptial enquiry form. Make sure you speak to him at least 6 months prior to your big day. Although the paperwork needs to be signed within 6 months of the wedding date, it can take some time to gather everything you need, get copies, translation and signatures where required – so allow plenty of time. You will need four copies of these. It’s normal for Spanish authorities to need more than one copy so ensure you have spares. Again, make sure you have more than one copy, and you will also need to ensure they are translated into Spanish and signed by a notary if the certificate is not self-explanatory. These need to be issued from your parish back home and signed/dated within six months of your wedding. Again, they may need to be translated. Not everyone has a confirmation certificate, but if you do then please ensure it is dated and signed within 6 months of your wedding date. It is rare for a priest to deny a bridal couple this right, but it always helps to have the support of your parish priest and a letter to confirm that. This is a document that proves that you are free to marry one another (ie not already married or related to one another). This can be obtained from your local parish. Please remember a separate certificate is required for both the bride and groom. Although you don’t officially need proof that you have attended this course run by your local church, we still advise that you bring all the details with you. Speak to your priest back home for information about classes. Once you and your priest have completed these documents, they will be sent to the Archbishop in your area. From here they will be sent to the Archbishop of the diocese in Spain, to the region of the country in which you will marry. From here, the Spanish Archbishop will check, stamp and send the documents on to your chosen church’s parish. If all paperwork is completed on time, they should arrive one month before the big day. Many of our couples ask us whether they need to have a civil ceremony back home, or in Spain, prior to their church wedding service. The answer is no. The Catholic ceremony in Spain is valid in any other Catholic country. As your wedding planners, we will take all your paperwork to the Spanish Town Hall and help you register your wedding legally the day after the church ceremony. Another question we are asked often is do you need to have lived, or stayed, in Spain any length of time prior to the wedding. Again, the answer is no. Obviously we advise our bridal couples to arrive in Spain a week, or at least four days, prior to the wedding to have time to check everything and enjoy some R&R before the big day. But as long as you are there a few days before you don’t need to have legally been in the country a certain amount of time prior to your church wedding. 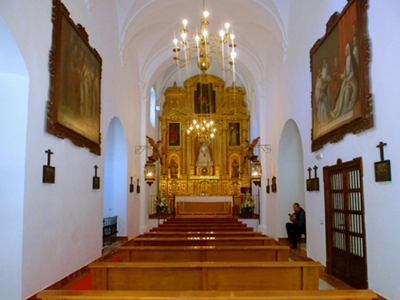 We hope this has helped answer your questions about your Catholic destination wedding in Spain. If you still have any questions about the process, or wish to visit the large array of breath-taking and historical churches in the south of Spain and Mallorca where we can help you get married, please contact one of the Sunshine Weddings Spain team. There is nothing we love more than a beautiful, traditional church wedding!